Yesterday we all spent the day resting. We slept in, studied, talked, and just relaxed. Today we were busy. I didn’t intend to be so busy. As I told EJ, one thing led to another, sort of like in the children’s story, If You Give A Mouse a Cookie…except without the cookie. “Or the mouse,” EJ said. First thing this morning, after a cup or two of coffee, I got the laundry sorted and took it to the laundromat. EJ usually goes with me, but he and JJ were sleeping soundly so I went without them. I got the clothes in the laundromat and then realized that I had forgotten the detergent. The laundromat wasn’t busy so I put the clothes in the washers and then drove home for the detergent. We only live a couple blocks away so it wasn’t a problem…except for the inconvenience. After I got the washed clothes home and the first load in the dryer, I swept and mopped the floors. EJ woke up and had breakfast. Our dog Danny has been scratching, so I wanted to give him a bath. I couldn’t find any dog shampoo, so since I had to get a few other things anyway, I decided to go to the store. Normally EJ would go with me, but we are trying not to leave JJ home alone much while he recovers. The ten-mile drive to the store was beautiful. I thought the scenery looked like a landscape painting, with the white/blue clouds and the colorful trees. I think the leaves must be at the peak of their colors. I would have taken a picture of it, but I didn’t have my camera…and, besides, I was driving. It’s sort of hard to drive and take pictures. On the way home, I saw a leafless tree with three black crows sitting in it. It was worthy of a picture, but…. After I had fixed lunch, I lifted Danny into the bathtub and gave him a bath. He was pretty calm about it. When I was done rinsing him off, I told him he could get out of the tub and he just stood there staring at me. “You aren’t going to make me lift your wet body out of the tub, are you?” I asked. Yes, he was. Ugh. I had a towel ready to rub him dry but he shook himself before I could get it on him. I wiped him off and then let him out of the bathroom while I wiped up water from everywhere and cleaned the bathroom. Danny has thick hair that takes all day to dry and he had tracked wet footprints through the house, so I mopped all the floors again. I realized that I needed to wash the shower curtain and liner, as well as the towels I used on Danny, so I drove back to the laundromat and washed them. I was tired by this time, but I cut off some of the tarp we had used to cover the RV, which we sold a couple of weeks ago. I used the tarp to cover the patio table and chairs on the front porch. I was about ready to sit and relax while I finished folding clothes, but EJ’s friend called and said he had wood ready for us if we wanted to come get it. It’s supposed to get cold and snow this week, so all the wood we can get before then is a benefit. We have gotten wood when it’s snowy and cold, and brrrr. A few years ago we stacked wood in the pouring rain. We had bought wood from this guy, and he let us haul the wood home in his trailer. We had to get all the wood unloaded and the trailer back before EJ left for work in the early afternoon, so we really had to scramble. As we went out to unload the trailer, it began to rain–a drenching downpour. We were carrying wood from the truck to the woodshed while it poured rain. We were absolutely soaked, sloshing with every step. We kept laughing; it was so ridiculous. Later a neighbor told us that her elderly husband looked out their window and saw us. “Why are the J’s unloading wood in this pouring rain? Why don’t they wait until the rain stops?” She said he was getting upset that we were working in the rain, worrying about us. She told her husband that maybe we HAD to do it then rather than wait for later. It was actually one of those family memories we remember with fondness: “Remember that time we carried wood in the pouring rain? Ha, ha!” But I must say that it really is more pleasant to get firewood on a nice autumn day with no cold temperatures or snow or rain. Anyway, this evening I asked JJ if he thought he’d be ok to be alone for a little while I helped his Dad with the wood. JJ is doing very well, but I think it’s very lonely to be recovering from surgery with no one around, so I try not to leave unless EJ is here. JJ said he’d be fine and he had his phone near him if he needed us. We were not far away. I took this picture of our truckload of wood with my phone. So EJ and I went to our friend’s place for the wood. This is the same friend who has the pretty chickens. 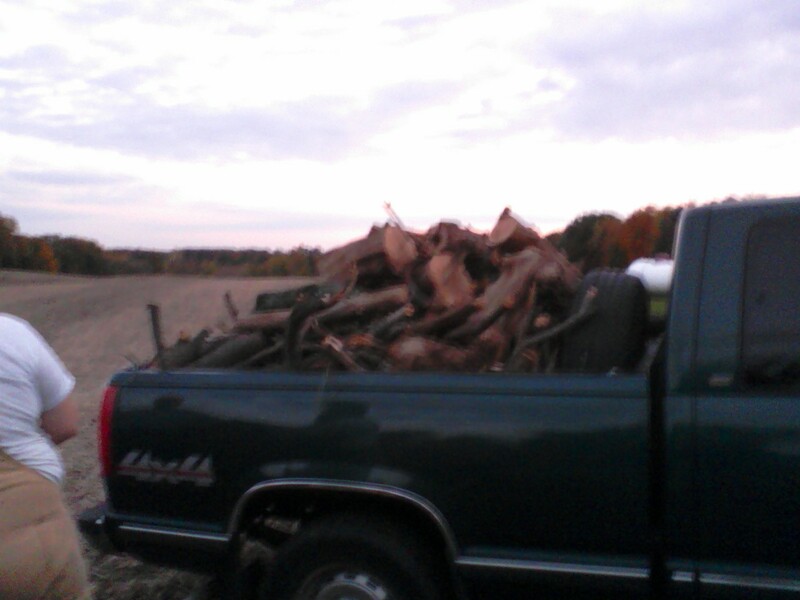 RB and his 18-year-old daughter jumped in the truck and we drove through the harvested field to where RB had cut down a dead tree and sawed up the wood. They helped us load wood into the truck and then we all drove home and unloaded it. At first we were all stacking the wood in the woodshed, but then we decided that to save time we’d just toss it out of the truck so we could go back for another load. It was getting towards twilight and we had to finish before it got dark. So back we went to RB’s place and the four of us loaded the pickup again. We still have more to get, but we didn’t have time tonight. A couple of days ago, I had asked RB’s wife if she had eggs she could sell to us. She said she didn’t have any to sell us, but she did have some she would give us. So RB told his daughter to go get the eggs, and then we all said goodbye and EJ and I left for home. On the way home, we saw a lot of deer. Several of them crossed the road in front of us. We got home without hitting any of them, and EJ backed the truck into the back yard. We will unload the truck and stack the wood as soon as we can. We were hungry so I made us popcorn. Then I sat down and said, “I am not going to do another thing today!” And so far I haven’t, although I do need to fold the last load of clothes in the dryer. Tomorrow we need to try to call the doctor and see if the pathology report is back. I tried to call on Friday but there were so many answering machine options (Press 1 if….) and I wasn’t sure which one to choose. None seemed to fit. There was no option to talk to the receptionist to ask which option I should choose. I was so tired that I finally gave up. On the day of JJ’s surgery the doctor said that the CT scan and blood tests were clear and the surgery went very well, so I wasn’t sure what the pathology report would tell me or how it would change the situation. I mean, if the tests were good and the surgery went well, wouldn’t that mean everything is good? All this is new to me and I don’t really know about these things. I chatted on FB about this with a friend who has recently had cancer and she said, “…Sometimes, even though the surgeon gets the entire tumor out with good clean margins, they still opt for some chemotherapy.” Then I thought, “Oh, yikes! Maybe we aren’t totally safe yet.” I sure hope the surgery was the end of it. EJ has talked to several guys at work who had testicular cancer and none of them needed chemo except one guy who lived with the problem for a year before seeking treatment. I hope we can get the pathology results tomorrow and I pray everything is ok. I also have to figure out what to do about JJ’s college classes. One professor, who has JJ in two of his classes, said we don’t have to worry about his classes. Another professor said JJ needs to drop her class. We haven’t heard from the third teacher yet, although Student Services emailed her and I have emailed her twice. So I don’t know if JJ needs to drop her class or not. We were told we need to fill out a NonAcademic Complaint Form for the class (or classes) JJ has to drop so that he can get an Incomplete and not have to pay for his classes again. We need to get official documentation from the doctor to prove that JJ has a valid reason for dropping the course(s). So I don’t know if I have to drop one class or two, or if I should fill out the withdrawal forms before I have the information from the doctor or not. We go to the doctor on Friday for JJ’s followup, so we can get the information then. I just feel like this is such frustration and I don’t want to have to worry about all this paperwork when I just want to help my son recover. I was thinking about people who have to deal with a bunch of paperwork when they are struggling with chronic health problems, or caring for a sick loved one, or grieving the loss of a loved one. I have great sympathy for them. They are already stressed or tired or grieving and have to deal with stupid paperwork. So hoping that paperwork thing works out. I love your story about the wood. I can so relate to days like this, but not with the son recovering. You are doing a remarkable job of coping. God’s blessings to you all. I think it’s not unusual to have chemo and/or radiation after a cancer surgery, even though the tumor is removed with clean margins. Sometimes they just do it as a precautionary measure. If this is the case for Jared, it will be an unpleasant experience, but it will be over soon and you will be able to get your lives back to normal. Hugs and prayers! Thanks, Sandy. It’s not what I want to hear, but at least we will be forewarned instead of blindsided.